Let's start with making a semiconductor chip (Learn VHDL with Naresh Singh Dobal series). So now let’s talk about that how do you make these amazing computer chips. Before that we should understand what are Integrated circuits, just think like that, a chip is a switch like a light switch, when you turn on the switch then the electricity goes threw it, and light will turn on, and when switch is off, then it’s blocks the current and light will off. So in the case of semiconductor it’s partially conduct the electricity threw it. So when it is ON electricity goes threw it and light will on, and when it is off then its blocks the current and light will off. So now you know every thing about the chip, that they are simply the switch, Cool na… so now you may surprise that ohhh the computer chips are only just like switch! 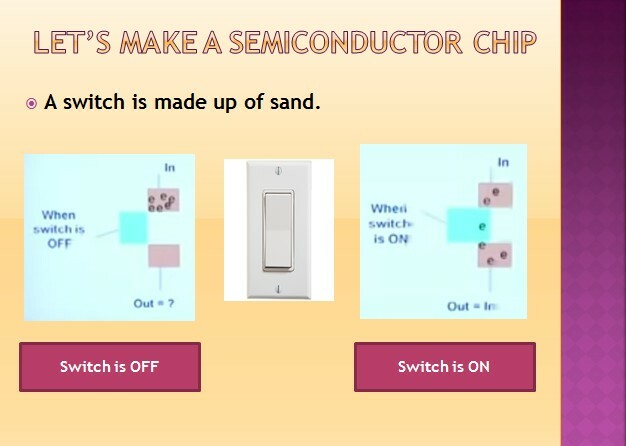 But this is little bit complicated than that, The important thing about these switch are they are made up of sand, and in our semiconductor industry it’s means to silicon. Silicon is the most abundant element on earth. This is very good material to integrate these switches. I recently learn that most of the sand comes from Australia. Because there sand is more pure. So now lets talking about the switches, so there are two switches, and you can see at the left when switch is off, then there is no flow of electrons and no flow of current, and in the right image when switch is on, the electrons flows to the other terminal and current flows, so turn these switches on and off like turn it on, turn it off, turn it on and so on, the electricity flows and blocks, according to switch through out the computer chips. Very simple it is.